When we last left off, Geminiman had gained a considerably large fan base after his twincest incident, which resulted in him milking it for all it was worth much to Spark Chan's dismay. Using this to his advantage, Alhazad kidnapped Sparkchan in hopes of having Geminiman giving up the energy of all his rabid fangirls and getting trapped when he makes a rescue attempt, as a result Geminiman went to the Photosphere alone and was captured by Boomerang while Zed successfully placed an energy stealing device in the Ark before getting trampled by fangirls. Some time later, Geminiman wakes up and finds himself bounded to a wall facing an unconscious Sparkchan. Alhazad: You've fallen right into my trap. How does it feel to be outsmarted by the best? Alhazad: I must say; youre a very interesting specimen Geminiman, part human, part android. Your internal workings are actually very similar to us demons. Geminiman: So what are you getting at? Do you honestly think I will work for you? Alhazad: Not really, however with your precious Sparkchan in our hands you haven't got much of a choice. Oh look she's waking up. Sparkchan: Gem...Geminiman? What are you doing here? Alhazad: The fool thought he could rescue you are I had Boomerang kidnap you. Alhazad: Oh how touching. Now, if you wish to see Sparkchan unharmed I suggest you do what I say Geminiman. Join us, join your fellow brethren. Geminiman: You obviously don't know me that well. Despite the fact I seem to battle Shadowman and the team every so often does not mean I would so willingly turn against the team. My honour and loyalty to my friends isn't so fragile. Besides, she would never forgive me if I betray all our friends just for her sake. Alhazad: Well then I guess that means I'll get all her energy and the energy from all those girls you left behind. Geminiman: Not unless I kill you before you can do anything. Alhazad: You make me laugh, how do you propose to do that if you're locked up against that wall. The twin terror splits into six clones leaving him bound to the wall while the remaining five land on the ground free to move. Geminiman: Remember, I can clone myself. Four of the clones shot at the bonds that were keeping the main one bound to the wall and he landed having all six against Alhazad on his own. Alhazad: But I have a hostage! The bloated Quarter Knight turned around to see the rest of the Mechanical Maniacs behind him with Sparkchan free from her bonds. Alhazad: But how did you know? Snakeman: It wasn't difficult. When Geminiman teleported to the Photosphere the fangirls caused a scene and we had to calm them down and that's when we found your note. Alhazad: No! How can I fail? My genius knows no bounds! Geminiman: To have knowledge, one must claim to not have knowledge. Face it Alhazad, you're a fool. The six clones dashed towards Alhazad and performed the Clone Collision technique on him before merging back into one and firing a Gemini Laser point blank at his face vaporising him. Geminiman: That takes care of him. Magnetman: Well that leaves one Quarter Knight, maybe we should finish him off so they don't bother us anymore. Boomerang: Actually two Quarter Knights, remember I killed Belselk and took his place. Boomerang: We have a score to settle Shadowman, but I have no interest in fighting you here and now. If you wish to go defeat Zeikfried I am not going to stop you as I have very little interest in sticking with him, I only seek a worthy opponent. Zeikfried: How dare you betray me Boomerang! You will pay for those actions! Boomerang: With what? You have no minions to attack me with. And if you attack me yourself you're only going to leave yourself open to attack from the Mechanical Maniacs. Zeikfried: Do you honestly think I am that foolish? I had a backup in the event I lost all my comrades. Boomerang: What? Are you going to sic Zed on to someone? Zeikfried: No, I am going to simply unleash all the energy we have gathered so far to create a new servant, one that will obey my every whim. Boomerang: But you haven't gathered much energy at all! In fact you've only gained a small amount from the death of Belselk. Zeikfried: Not quite, despite Zed's recent defeat at the Ark, he was able to successfully store an energy draining device inside it and with all those girls causing all kinds of chaos they have been feeding the machine non-stop. Now I will have a sufficient amount of energy to create the ultimate being! The last remaining Quarter knight flips a switch on the machine behind him and it begins processing the data. Geminiman: A being made entirely out of energy, but if such a thing existed if it suddenly went unstable it would cause all kinds of chaos. Needlegal: Then we have to stop it from being created. 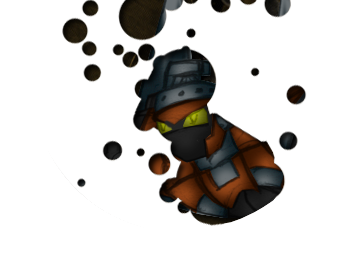 With that, the Mechanical Maniacs leaped into action and went straight for the machine creating the energy beast. Zeikfried: I can't let you interfere with my plans. Boomerang: Zeikfried, you started this fight against me so you had better stick with it! The demon ninja threw the Saber Fang at the knight who deflected it with his lance giving the team an opening to destroy the computer. Shadowman: Hit it with everything you've got! The team fired all their weapons at the machine causing it to go haywire and create a small explosion which hit the entire team. Away from the explosion Zeikfried looked over and rushed to the machine's debris with Boomerang in pursuit. Shadowman: Did we stop it? From all the smoke a green glow could be seen and a creature emerged from it. It appeared to have six arms, wheels on its feet, a tail and a crystal crest on its head, and in fact it looked like all the team merged into one form of energy. Snakeman: It took the form of all of us. Needlegal: It must have scanned us all when we attacked it during its birth. Zeikfried: Excellent, I shall name you Mecha-Energy! Now my magnificent creature! Destroy everything! Turn everything into dust! The energy responded by suddenly blinking (Magnetman's ability) in front of Zeikfried, grabbing him with its giant hands, (Hardman's strength) stunning him with two electrical conductors, (Sparkchan's attack) and then firing a barrage of needles at rapid speeds into his torso ripping him to shreds (Needlegal's attack). Hardman: It killed him! It killed him good! Shadowman: Attack it while its back is turned! Again the Maniacs unleash their firepower on the Mecha-Energy but it instantly blinked away from all the attacks and then split into six clones (Geminiman's ability) and formed two additional holograms (Shadowman's ability) to match the team and then blinked right in front of them catching all of them by surprise. Topman: How are we supposed to keep up with that? The Maniacs all jumped to different sides of the room and each of them was pursued by a Mecha-Energy clone. Geminiman: If it knows all of our abilities, in theory six of them should be capable of taking damage while two of them are just holograms. Sparkchan: But which ones are the real ones? The team try to attack their respective clones but before an attack could even land all of the Mecha-Energy clones blink out of the way confusing the team even more. A boomerang comes flying in and makes the two holograms vanish and knocks back one of the clones. Boomerang: Perhaps this fight could be interesting. Shadowman: Why are you helping us Boomerang? Boomerang: I can't let that thing kill you before I settle our score. Besides, it does seem to be a fight worthy of my skills. The Mecha-Energy clones suddenly fused back into one and then began to spin (Topman's ability) whilst firing needles everywhere destroying everything around it. Magnetman: How can we hit that thing if it moves that quickly? Shadowman: If we cannot hit it then we must be able to contain it at the very least. Shadowman: Yes, if we can find a way to just trap it then we won't need to worry about it going out there and destroying the world. Needlegal: Yes, but how do you consider trapping that thing if we can't even hit it? Sparkchan: Well, we could always try luring it into something. Sparkchan: Well, Zeikfried mentioned that the energy he absorbed to create this thing in the first place was obtained through some sort of device they managed to install in the Ark. If this thing is pure energy than once it gets within range of it, the device will absorb it and send it to somewhere that can maintain it. Geminiman: The thing is; the machine that maintained the energy was destroyed when Zeikfried unleashed Mecha-Energy against us. Sparkchan: Well then we'll just have to find something else to replace that device. Shadowman: You mean like a Pokéball? Needlegal: Why do you still have those things? Shadowman: Well they have pulled through for us on many occasions. Geminiman: Well it appears that would probably be the best we can hope for. Snakeman: The only problem remaining is how are we supposed to lure that thing back to the Ark? Boomerang: Foolish robots, a little game of cat and mouse would do the trick. The Demon Ninja catches the attention of Mecha-Energy by throwing the Saber Fang at it resulting in the energy to blink in front of him, but the ninja was fast and leaped back to prevent his foe from striking him up close, unfortunately for him Mecha-Energy split in two and grabbed him from behind. Boomerang: Damn, it's too fast! Shadowman: Guys, teleport back to the Ark, I'm going to do something very stupid and suicidal but if it works, you guys have to be back at the base. Geminiman: Wait! You not going to try teleport Mecha-Energy back to the Ark, are you? Shadowman: It seems like the only way. Geminiman: Then I have to stay here too. That thing has all our abilities and that means he can split into 8 forms thanks to our combined cloning powers which means you need me to be able to hold off any clones he'll try to create in your attempt to teleport him. Not to mention someone needs to setup the Pokéball on this end as well. Shadowman: Fine, but the rest of you go! We have to keep it within the Ark so it can get completely absorbed. Needlegal: Right, we'll do our best. Magnetman: Don't die on us guys. The Maniacs, save for Geminiman and Shadowman teleport out while Shadowman then began to approach Mecha-Energy as it was about to finish off Boomerang. Shadowman: Here's the Pokéball, I hope you're ready for this. Geminiman: Come on, We've been through so many suicidal battles we've lost count. One more is not going to kill us. Shadowman: Well then, here I go. Making a mad dash at Mecha-Energy, Shadowman leaps into action while Geminiman threw the Pokéball at the remains of where the being emerged. Aware of this attack, Mecha Energy split into more clones and dodged Shadowman's attack giving Boomerang enough time to break free from his captor's hold and Geminiman enough time to split into six to match the numbers. Shadowman: Remember, two of them are just holograms; we need to be able to eliminate those two and teleport one of the clones back to the Ark, the rest shouldn't matter. The Geminiman clones turn invisible and attempt to surprise Mecha-Energy however they are quickly spotted by the being's ability to use infra-red vision (Snakeman's ability) forcing them to uncloak themselves and combine back into one. Geminiman: If invisibility is not going to work then I'm going to have to rely on my luck. Using a bit of cunning, Geminiman fired off two Gemini Lasers and split back into six again as the lasers bounced around the room in hopes of it eventually hitting a Mecha-Energy clone. Shadowman: Hmph, if we keep throwing attacks at them, one of them is bound to get hit. Following suit, Shadowman summons the giant frog and creates two holograms which proceed to throw barrage after barrage of Shadow Blades while the frog uses its flamethrower. The clones begin blinking everywhere almost effortlessly dodging everything back eventually after the two robot masters ran out of weapon energy they noticed only six clones remained. Geminiman: The holograms are gone! Attack it now before they reform! The Geminiman clones rush towards various Mecha-Energy clones however they were easily countered by the Mecha-Energy, but while it was attacking the clones Shadowman was able to get the jump on one and grab it. Shadowman: You can't get away now! With a blinding flash of light Shadowman and the six Mecha-Energy clones disappeared just leaving an exhausted Geminiman and Boomerang. Back at the Ark, the Maniacs await the arrival of their leader and Mecha-Energy and are quickly met with a huge flash of light. Hardman: Argh! I am blind! Shadowman: Just make sure it doesn't escape! Magnetman: You think you could have made a less frightening entrance. Shadowman: I'm teleporting with a form of energy capable of ripping us into shreds, I think just teleporting here is impressive enough. Topman: Guys, I think maybe we should be focusing more on the psychopathic energy bouncing around the room trying to escape! The team set their sights on to the Mecha-Energy desperately trying to escape but after closing off all its escape possibilities, the energy just dispersed from all the absorption. Sparkchan: Finally, that was scary. After absorbing all of Mecha-Energy, the energy absorber was located by Snakeman and crushed. Snakeman: Stupid device, it's caused us too much trouble today. A beeping sound came from Teletran One and Geminiman appeared on the monitor holding a Pokéball. Geminiman: Well guys, we've managed to contain Mecha-Energy in this Pokéball. What should I do with it? Hardman: Destroy the stupid thing! Magnetman: Wouldn't that just release it and make all our efforts useless? Hardman: Oh, well then don't destroy it! Shadowman: Just bring it back to the Ark; we'll just keep it secure somewhere, I don't trust it to be held anywhere else. Geminiman: Very well then, By the way, Boomerang left a short while ago. He said he'll settle the score with you some other time. Sparkchan: Well now that all this is over lets just celebrate with some yummy desserts! Shadowman: How so? I mean all we did was one big battle against an overwhelmingly broken enemy suffering a severe case of SNK Boss Syndrome that we only really beat through the shounen law that the hero always beats the villain in the final battle. Needlegal: We learned that everything, no matter how cheap, broken or unbalanced it is must have some sort of weakness somewhere. Otherwise it just isn't fun to fight it. Topman: Well until someone creates villain so powerful that all the heroes in the world can't stop it. We are... The Mechanical Maniacs! That Ninja from Ninja Gaiden: Ah, Shadowman! Long time no see. We have a new member to the society to introduce to you. Boomerang: I told you I would settle the score with you some other day. Shredder: Yes, we've been getting bored lately so I thought we could a good ninja showdown would be interesting to watch. That Ninja from Ninja Gaiden: Unfortunately something else has come up. Some of my associates have been struggling against a foe and I have heard you two had experience fighting something similar. Boomerang: Well then this ought to be interesting. Shadowman: For some reason, I have a bad feeling about this. The Secret Society goes down to the basement of a huge Tri-Tower complex and enters a room filled with glowing green pods to find some ninjas fighting off a glowing female form of energy. Shadowman & Boomerang: Not again!